There are two major behavioral problems that poultry owners must tackle at the first appearance. Both can be caused and cured. Egg-eating generally occurs when a hen finds a broken egg, tastes it, likes it, and begins searching for broken eggs. Then she learns to break them herself. Broken eggs occur more often when there is inadequate litter to cushion them, inadequate nutrition (either via improper feeding or heavy parasite or disease challenges) that results in weak egg shells, and infrequent gathering. The longer an egg lays in the hen house, the greater the chance it will be broken. So frequent gathering is your primary weapon against egg-eating. Broody hens can increase the likelihood of broken eggs because they constantly occupy a nest and they cause increased traffic in the other nests. Bright lights in the nesting area are a stressor that can increase nervousness and picking behavior. Scaring hens out of nests can also result in broken eggs. Always approach hens quietly and encourage gentle movement. Finally, if eggs are being broken, you must find the perpetrator and get rid of her. Hens that learn to eat eggs must be culled, as they will never give up the habit and they will teach it to other hens. However, before culling, make sure the culprit is, indeed, a hen. Egg-eating hens will usually have dried yolk on their beaks and heads. If your hens are clean, suspect another culprit. Snakes, rats, weasels, even domestic pets all enjoy eggs. 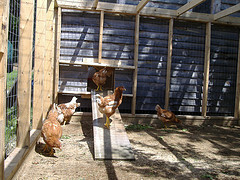 Be sure your hen house is well-barricaded against predators and unwelcome visitors. Cannibalism is a vicious habit that is upsetting and costly. It can occur in fowl of any age, breed, strain, or gender. It is almost always caused by stress related to poor management. Once stressed, birds begin picking at the feathers, vent, comb or toes of another bird. Once blood is tasted, this terrible habit can spread like wildfire through the entire flock. Unless you eliminate this problem immediately, it rapidly gets out of control. Be sure to adjust heat lamps and brooder temperatures as chicks mature, and keep all buildings well-ventilated, especially during the hot summer. Very bright light or lengthy periods of bright light induce hostility in birds. Use dim lights to calm and comfort birds. 40watt bulbs provide plenty of light, and 25watt bulbs can be calming. Heat lamps should be red or infra-red, as this helps maintain a dimly lit environment. Hunger, thirst and the need to fight for food induce aggression. Keep ample food and water available, with plenty of feeder space for the number of birds present. Very high energy, low fiber diets increase activity and aggression levels. Lack of protein or specific amino acids can encourage feather-picking. Feed a high-quality feed, and minimize the role of table scraps. Scratch grains scattered about can give the birds something to do, but they should not constitute more than 10% of the birds‘ diet. Combining birds, especially those of different ages or with different traits (such as crested and non-crested fowl) disrupts the pecking order and can cause pecking due to curiosity. Always make changes as gradually as possible. If changing feeder types, be sure to leave the old equipment in the pen for a few days. Gradually adapt birds to new diets, new feeding times, new lighting schedules, etc. Birds will naturally pick on defenseless companions due to curiosity and social order. Slow-feathering birds have young, tender feathers exposed for a longer period of time and are therefore susceptible to pecking. There are some things you can do to keep your flock busy and happy. Having an enclosed run to encourage exercise is beneficial. Providing fiber via clover, grass or weeds helps increase contentment. Aggressive game birds can be fitted with a variety of “peepers”, small plastic “blinders” that attach harmlessly to the beak and limit forward vision, thus limiting the tendency to fight. If you experience a cannibalism outbreak, closely review all your management and environmental circumstances. Darken your facilities with red or low-wattage light bulbs, remove injured birds, lower the pen temperature if possible, and apply “anti-peck” ointment or pine tar to damaged birds. Identify and remove overly aggressive birds. Do not return to normal lighting, etc., until serenity has returned to the flock, and then do so gradually! This entry was posted on Thursday, May 15th, 2014 at 8:35 am	and is filed under News & Updates. You can follow any responses to this entry through the RSS 2.0 feed. Both comments and pings are currently closed.